Today I went into the big city with Kim to pay an afternoon visit to the Purple Purl. 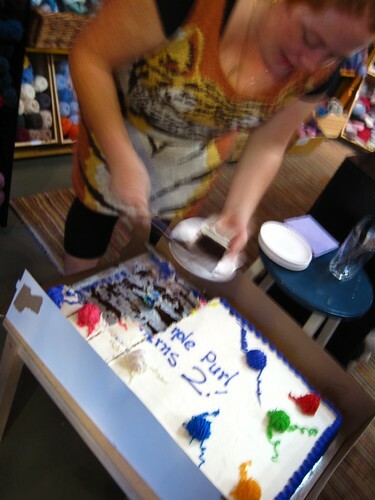 It was a Very Important Occasion indeed, as they are celebrating their 2nd Anniversary as a yarn shop. Happy anniversary and many happy returns, Jennifer and Miko! 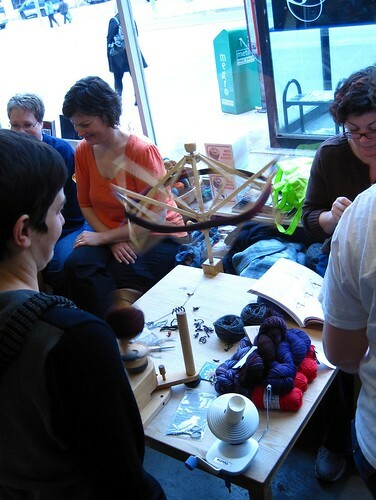 It’s hard to imagine the Toronto knitting scene without you. Lots of fabulous yarn, friendly faces, and tea and goodies…what more could a knitter want? What a wonderful and cumulative transformation the shop has had since their (already welcoming) opening day. Today they were vibrant and bustling. I sometimes forget how many friends I actually have made in the knitting world, but I always remember pretty quickly again once I’m at the Purl. I am just so pleased that they are a part of Toronto’s wonderful knitting community and that they are thriving. 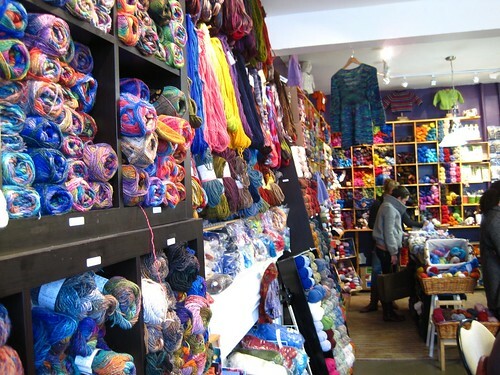 The world needs knitting shops, and knitters. So all in all, not a bad Sunday afternoon. Happy Anniversary, Purple Purl! Are you sure you’ve only been here 2 years? It feels like more. 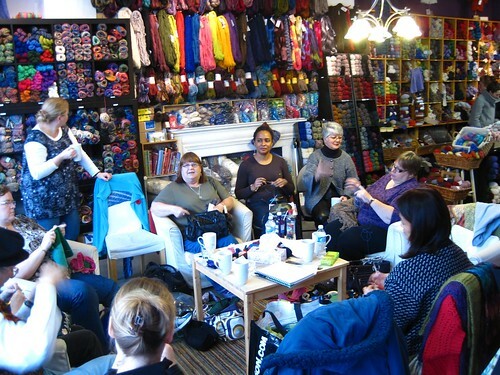 That looks like a wonderful shop and a great group of knitters! This is going to be one of my first stops once I’m outta here. I’ve been wanting to go for a long time. Glad you could enjoy the fall day. That does look like an awesome shop. I love the colors in the photograph of the yarns along the wall. It was fabulicious to see you today – I wish you lived closer! Any place that welcomes fiber arts and fibery people is a good place. 🙂 And cake. Cake is always good. 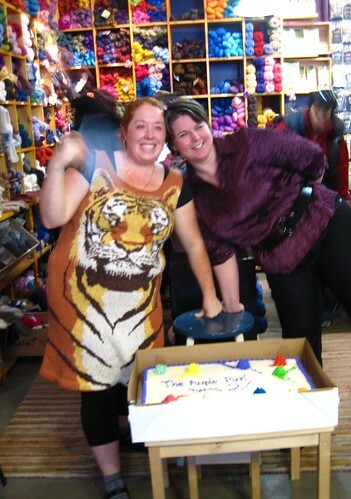 Is her tiger dress knitted? That is awesome! You know, it’s a hike for me to get out there, but I always do love the Purl whenever I go. It’s such a jolly, welcoming space. The shop looks absolutely wonderful. You’re so lucky to live near a yarn shop like that one. Looks like a great day!! And I love white sheet cake, it’s the perfect party cake. I *heart* the Purl. I really should go there more often. That looks like a fantastically good time! I love the first photo – the colors are so vibrant. Thank you so much for your kind words! We are so pleased to be rocking the Toronto knitting scene as well. it is a dream being lived and it is made possible by the wonderful and generous people who frequent our purl of a shop…and that means you! hugs & many thanks! That shop looks incredible! And you’re right, the world does need more yarn shops and knitters. Knitting promotes calmness, well, except when you discover that dropped stitch 3 inches back.